A parish workhouse existed at the north-east of Hartley Wintney, on land that is now part of a local golf course. Hampshire: Bramshill, Crondall (3), Dogmersfield, Elvetham, Eversley, Grewell, Hartley Wintney (2), Heckfield, Mattingley with Hazely, Odiham (3), Rotherwick, South Warnborough, Winchfield. Later Additions: Cove (1869), Crookham (1894), Farnborough (1869), Fleet (1894), Hawley with Minley (1869), Long Sutton (1869), Yateley (1869). The population falling within the union at the 1831 census had been 9,830 — ranging from Bramshill (population 166) to Odiham (2,647) and Hartley Wintney itself (1,139). The average annual poor-rate expenditure for the period 1831-34 had been £7,439 or 15s.2d. per head of the population. 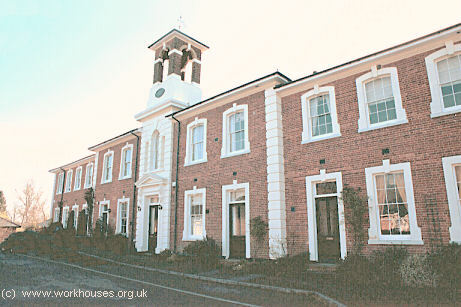 Initially, the Hartley Wintney Union made use of the existing Hartley Wintney parish workhouse. In 1836, the Poor Law Commissioners authorized an expenditure of £2,000 on its alteration and enlargement. The site location and layout are shown on the 1874 OS map. 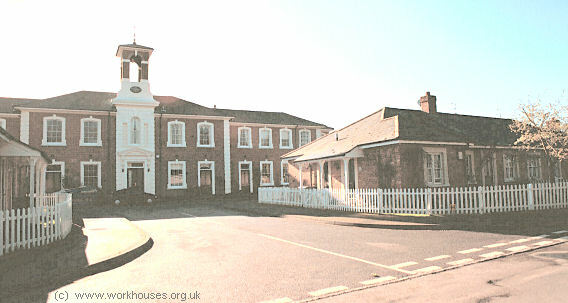 Hartley Wintney old workhouse location, 1874. In 1869, the adjacent Farnborough Gilbert Union was dissolved and its member parishes transferred to the Hartley Wintney Poor Law Union. In 1871, a new workhouse was erected at Winchfield. Designed by Edmund Woodthorpe of London, the building cost £11,739 and accommodated 120 inmates. The new site is shown below on a map from 1909. Hartley Wintney new workhouse site, 1909. THE NEW HARTLEY WINTNEY UNION WORKHOUSE, ODIHAM. The new Hartley Wintney Union Workhouse is now in course of erection at Winchfield Hurst by Messrs. Joseph Bull & Sons, of Southampton, contractors (who have carried out various works in Hampshire and the adjoining counties), from designs by Mr. Edmund Woodthorpe, of London, architect. The members of the Board lately visited the new edifice in procession to complete a tablet which has been erected there containing a list of their names. They were met at the entrance of the building by Mr. Woodthorpe, Mr. H. W. Bull (the senior partner in the firm of Bull & Sons), the clerk of the works (Mr. H. Sanders), two of the architect's staff, the foreman of the works, and others, and the large party were then conducted over the new workhouse. In the main entrance are the male and female tramp wards, and then comes the courtyard, which brings one to the entrance of the main block, where are the boardrooms, dining-hall, kitchen, offices, &c. On the left are work-sheds and laundries, with spacious courtyards leading to the infirmary, which is very nearly completed, as are also the fever wards, the latter being in a forward state. The building is in five blocks, somewhat similar to those at the Southampton Workhouse, and the three in the rear are rapidly approaching completion. The main block and other parts are also roofed in and slated. The house is designed to meet every requirement and regulation of the Poor-law Board. The contract is 10,0001. The chairman called the workmen around him, and ordered that they should be supplied with refreshment. The party afterwards partook of a déjeûner at the George Hotel, at the invitation of Messrs. Bull & Sons. At the front, two entrance blocks included male and female tramp wards, with a courtyard behind. The main block included the board-room, offices, dining hall, kitchen etc. Behind the main block were various workshops, the laundry, and courtyards. An infirmary and fever wards stood at the rear. A chapel was added at the south of the site in the latter part of the nineteenth century. The workhouse later became Winchfield Public Assistance Institution and then Winchfield Hospital. 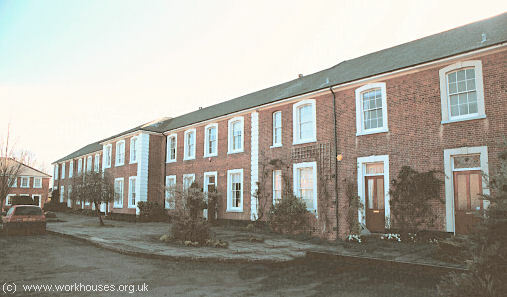 The buildings were converted to housing in 1985. In 1849, Hartley Wintney joined with the neighbouring Farnham Union to establish the Farnham and Hartley Wintney School District, through which education for pauper children was jointly provided by the two unions. A separate page describes the operation of the Farnham and Hartley Wintney District School. Hampshire Record Office, Sussex Street, Winchester SO23 8TH. Very few records survive. Illustrated History of Winchfield and the Hospital by Anne Pitcher, 1985.